Hitman is a 5 reel, 15 payline, online video slot machine. 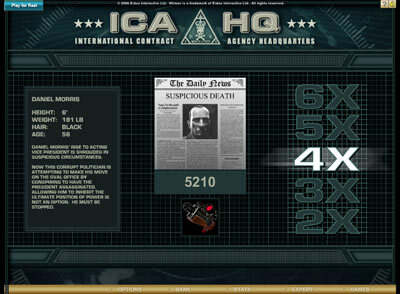 the game has a sinister theme with photo-realistic graphics, from Hitman Agent 47. The game has bonus features appropriately themed with the franchise, such as a bonus board you get to pick your target and the assassination weapon which determines the multipliers you get and your overall winnings. While I can see this theme appealing to some people, the dark atmosphere doesn't make for a very entertaining combination for me. Like all five reel slots payouts are valid on matching symbols from left to right (on a wagered payline). The 18 symbol appears on the last three reels. If you spin in 3x 18 symbols you are then given an automatic eighteen free spins and are awarded the total amount won from those spins which can be as much as 40,000x your coin size. The insigna symbol appears on the first three reels. If you spin in 3x insigna symbols you can then pick one of them to reveal a hidden bonus multiplier. The wild symbol is will substitute itself for any symbol to match your lines. The bonus is activated by spining in 3 bonus symbols (note these only appear on the last 3 reels). The bonus game takes the theme of an assisantation mission where you pick your target and the assisantation weapon. Each target as a bonus value range which you're awarded a random amount which is then multiplied by the bonus of your weapon which can total as much as 67,500x your coin value. 32 Red has a reputation that precedes itself, offering the best customer support we’ve come across and one of the few casinos offering a RISK FREE, no deposit bonus of £10 and £32 free for every £10 deposited. Mummy’s Gold has an excellent reputation thanks to their great promotions and first class customer service. This Las Vegas inspired casino features huge jackpot slots often reaching £2 million! Mummy’s Gold is currently offering an interesting risk free promotion where you are given £500 and 1 hour to win as much as you can.